To listen to your mp3 audiobooks in the Deseret Bookshelf app make sure your Apple device has iOS 8.0 or higher and your Android device has Android 4.4 or higher. 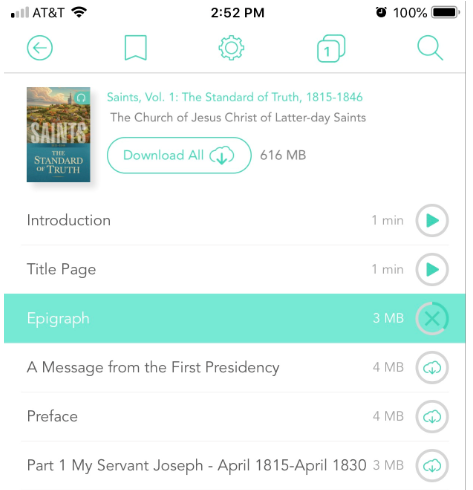 If you have consistent, high speed wifi/internet for your device and enough free memory space on your device you can successfully listen to your mp3 audiobook in the Deseret Bookshelf app. If your mp3 audiobook is not showing up in the My Library tab on the app for your Apple or Android device logout of the Deseret Bookshelf app and then log back in: Tap on the My Account icon in the bottom left corner of the screen, and tap on the red Logout button towards the bottom of the screen. Log back in with the Deseret Book email address login and your Deseret Book password. You should be able to see you mp3 audiobook in your list. Once you have found the audiobook in your Library, tap on it to open it. Once in the book, you will have the option to Download All chapters at once, or download chapters one-by-one. A chapter must be downloaded before it can be listened to. If a chapter is not downloaded, it will download before it plays. This means that it will use cellular data if you are not connected to WiFi. Play Button - This means that the chapter is fully downloaded, and can be listened to. Cloud - This means that the chapter needs to be downloaded. X - This means that the chapter is in the process of being downloaded. We recommend that you ensure that each and every chapter is downloaded before you begin to listen to any part of the audiobook. This will provide for the best listening experience. The easiest way to do this is to tap "Download All" and patiently wait while each chapter is downloaded. If any chapters get skipped over, or don't download due to lapse in internet connection, you can download the individual chapter by tapping on the icon of the cloud next to it. As long as the chapter is downloaded prior to going offline, you will be able to listen to the audiobook while not being connected to the internet. If you experience any difficulties with downloading audiobooks, or if you notice that files are not playing correctly, please send an email to downloads@deseretbook.com and we will make sure it gets taken care of.